Chestnut crab apples, riping in early Sept., are a long ways off from being in season but as my inaugural post for TCW I think it fitting as its one of my all time favorite preserves. Picking and preserving has always been an avid interest of mine. If you find yourself, like I do, active in gardens and certain farming circles you can often find yourself with an abundance of veggies and or fruits to preserve. I was searching for a way to preserve the sweetness of late summer in Minnesota. An apple was a really good place to start. Most recipes I had come across called for cooking crabapples down in spiced sugar syrup. I came across this recipe in Linda Ziedrich’s Joy of Pickling. The original recipe called for Gravensteins but I greatly prefer the MN chestnut crab apple. They are actually sweet, slightly tart and firm fleshed and the size of a golf ball or somewhat larger. Once Pickled they retain their crunch. These pickles are a lacto-fermented pickle which for a sweet thing like an apple means an ever changing living probiotic environment. They will eventually (3-6 weeks) start to get “too tangy” and produce some alcohol (not significant). Slice them through the middle and serve them with cheeses, cured meats, a savory nut spread or pates such as chicken liver or smoked salmon. They are excellent mandolined into salads. This recipe is from Linda Ziedrich’s “Joy of Pickling”, which covers many methods of pickling including fermenting. This is an old Russian way of preserving apples. The reason I like it is because the apples stay firm and crunchy. I have made this every Sept. for the past 7 or so years. The results vary from ok to amazing. 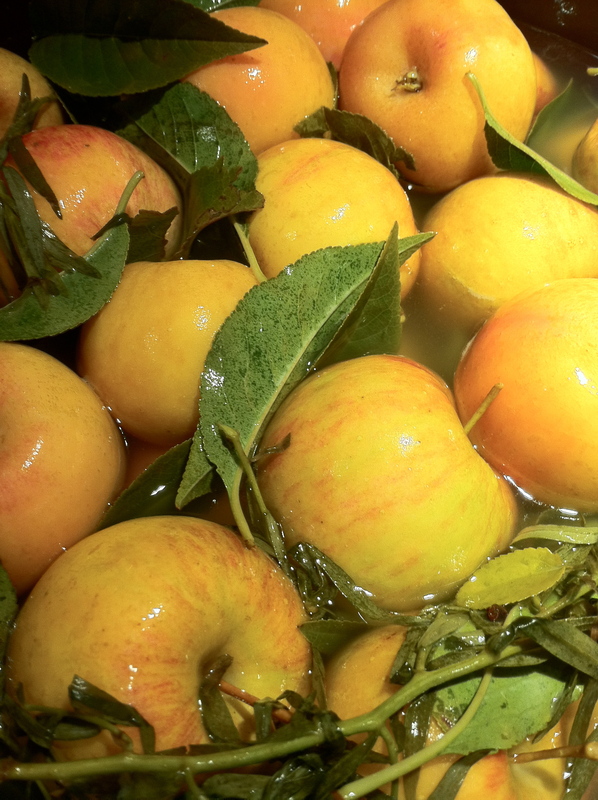 The apples take on a flavor quality of sparkling wine, laced with tarragon. 8 t pickling salt – if using a flaky kosher x’s 1.5. Pickling salt is used because it is uniform in consistency – provides a common measure among recipe users. 2-3 handfuls of sour cherry leaves – needed to keep the apples firm. other leaves with tannins that do the same are grapes, currants and oak but the later will yield a unique flavor. I have tested cherry and grape and the cherry leaves work the best. Ask your farmer/orchardist for some if you don’t have access to a tree. Alum, or aluminum, is what is used as a commercial firming agent. 4-6 tarragon sprigs – french, not russian. 1. Using a stainless steel pot (not aluminum) bring the water, honey and salt to a boil, allow to cool. I do this in the AM or night before, if it’s a big batch. 2. Using a 1 gallon jar or a crock, spread some cherry leaves and tarragon on the bottom; place a layer of 3-4 apples on top, repeat with cherry leaves and tarragon, then apples, until full. Make sure to leave head space to allow for a weight of some kind. 3. At this point the brine is poured over and you are using a wild culture on the apples themselves. 4. Weight the apples with something so that they are submerged under the brine: plate, zip-lock bag filled with brine. Ferment at 70 degrees roughly for 5-6 days or until fermentation slows. 5. Remove the bag or plate, cap tightly and put into a cold place below 50 degrees, such as the refrigerator. Let the jar stand for 30-40 days before eating the apples. Maybe strictly below 38 degrees is the best bet. They are edible before 30 days. I usually give them a week to two. There several things to watch for. The fermentation will continue to go if not kept cool enough. I have had them turn to producing alcohol. Also, the flesh might wrinkle a bit but does not affect the flavor. Next September I will experiment with using a whey or keffir starter in this recipe.